ExCEL Exhibition: The Exhibition will showcase innovation and digital technology possibilities in the Public Service and the Private Sector. 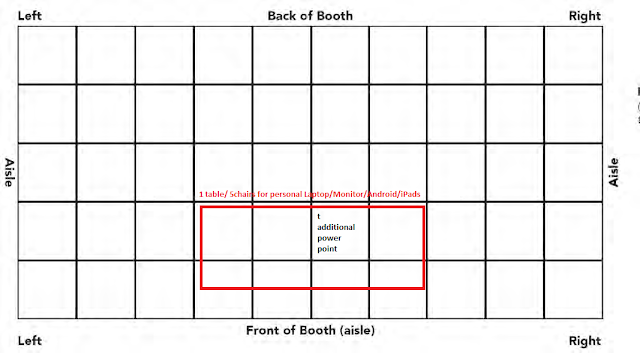 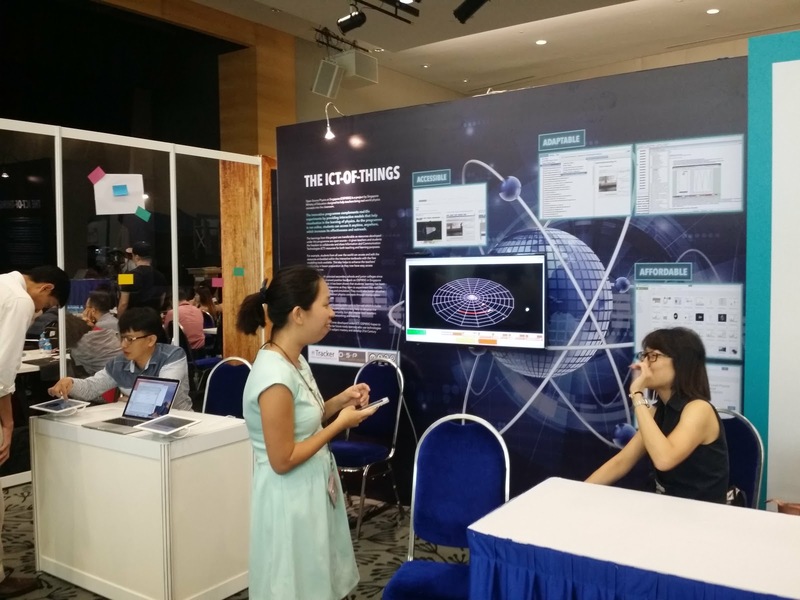 There will be interactive booths and exhibits by public agencies and private sector companies to engage the audience. All ministries will be invited to submit their best projects that are aligned with the theme for the exhibition. 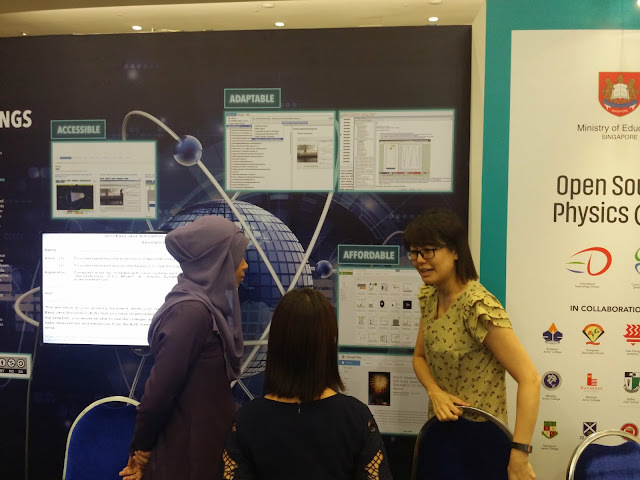 The learnings from this project are transferable as resources developed under this programme are open-source – it gives teachers and students the freedom to collaborate and share Information and Communication Technologies (ICT) resources for teaching and learning of Physics. 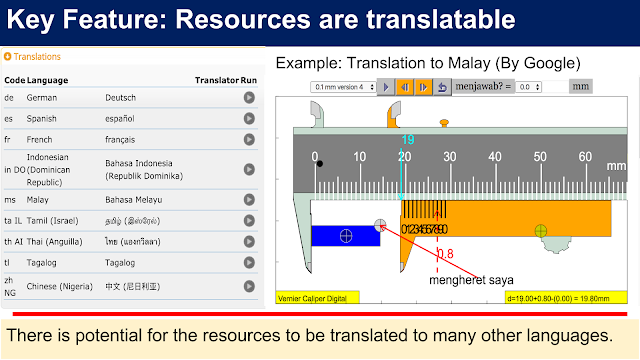 For example, resources can be embedded within interactive textbooks. 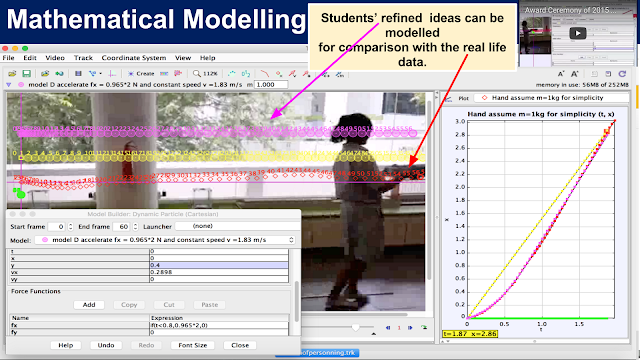 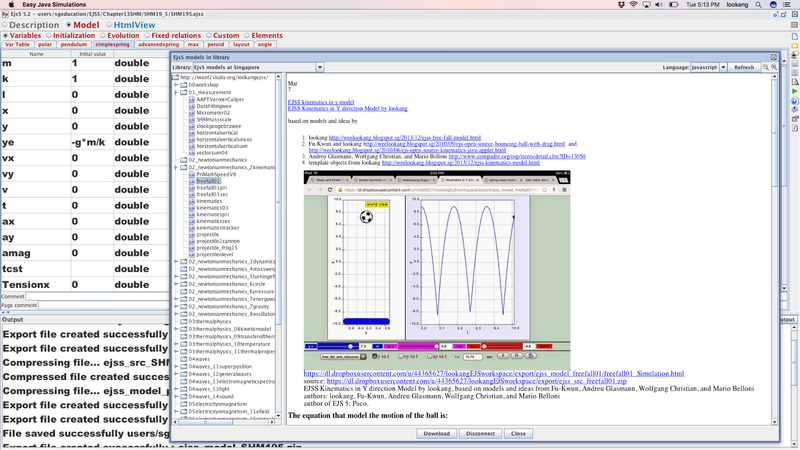 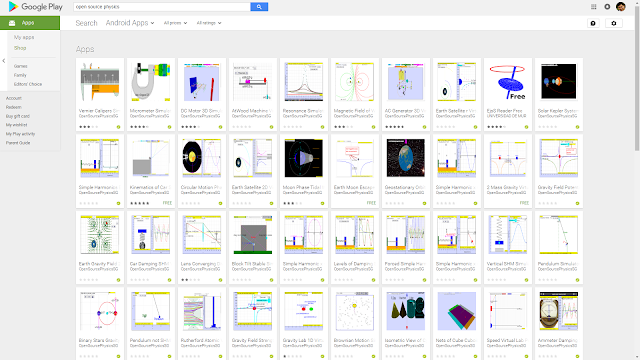 The modelling tools available are free for students all over the world to access and edit. Anyone could remix, redistribute the customized or re-purpose resources under the licenses compatible with creative commons attribution. This helps to enhance the teachers’ productivity in the lesson preparation as they can have easy access to the resources and need not start from scratch. 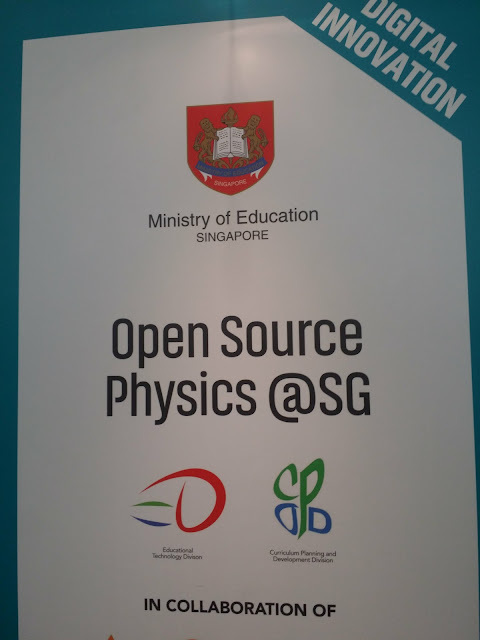 Since 2012, MOE has been collaborating with schools¹ on OSP@SG, with positive feedback received on the project both in Singapore and around the world. 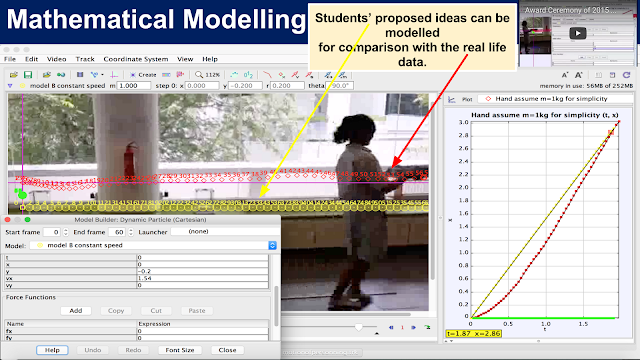 Some benefits include enhanced students’ learning through the student-centric pedagogy where students learn to experiment like real life scientists using modelling and simulation. 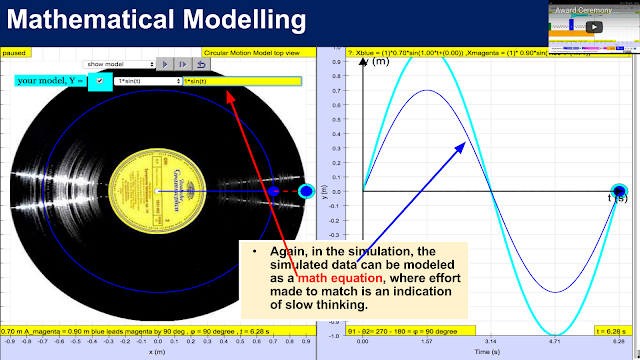 Students could better visualise, explore and discover abstract physics concepts through manipulation and modelling techniques. In addition, an interest-based learning community for the OSP@SG has been formed. This community include the many OSP experts namely, Professor Francisco Esquembre, Fu-Kwun Hwang, Wolfgang Christian, Felix Gracia and Douglas Brown and many more in the world who helped to develop the materials to sustain the community. By networking and learning with the experts, teachers in local schools are now taking greater ownership of the materials they author by either remixing the models or creating new worksheets to support the guided inquiry or modelling pedagogy afforded through OSP@SG. 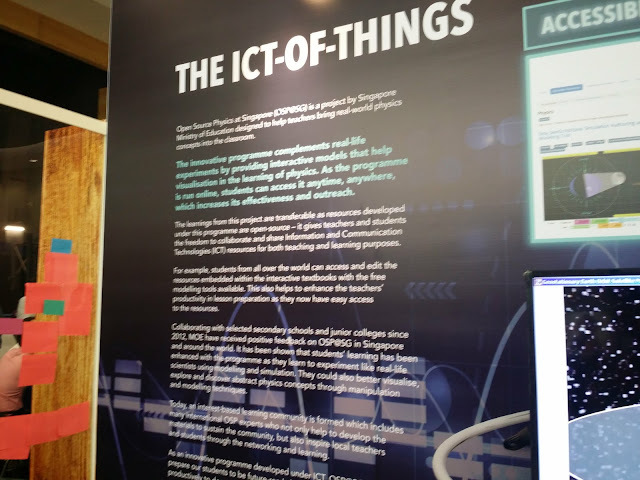 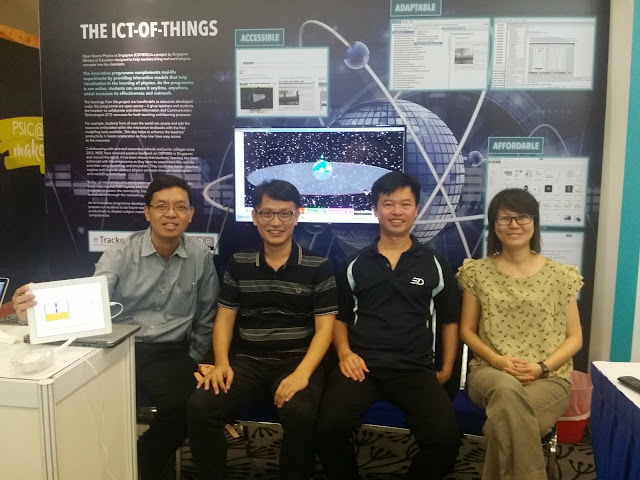 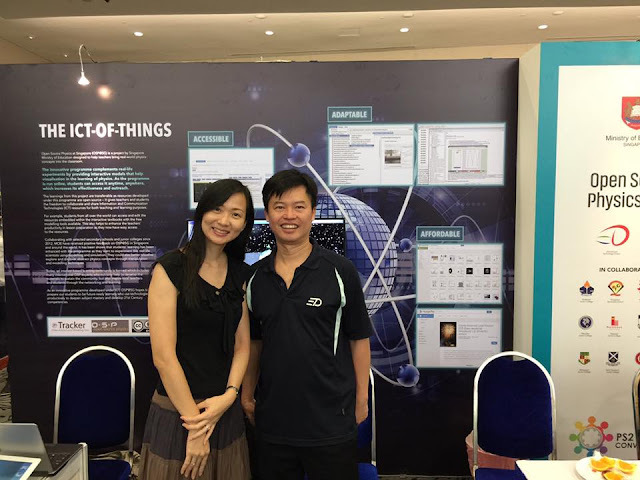 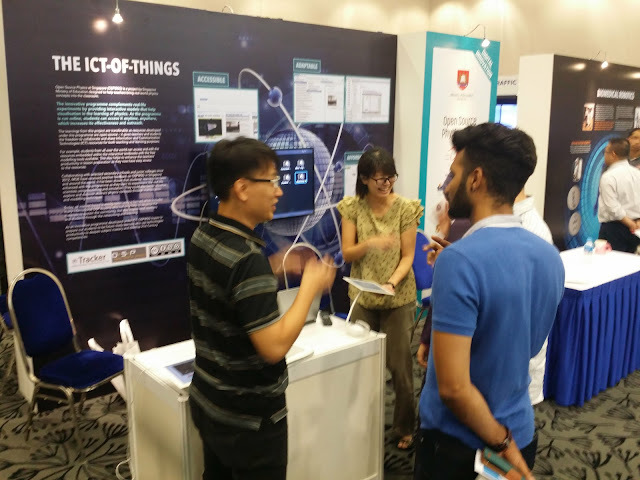 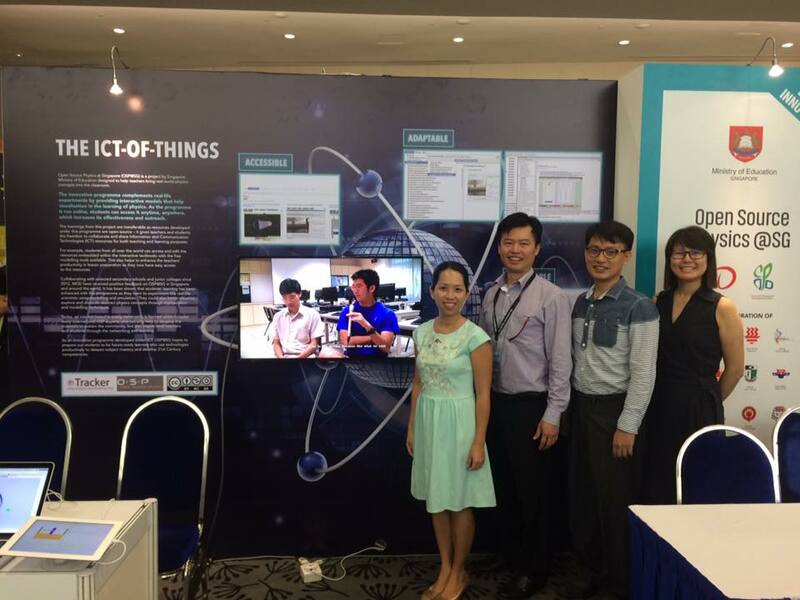 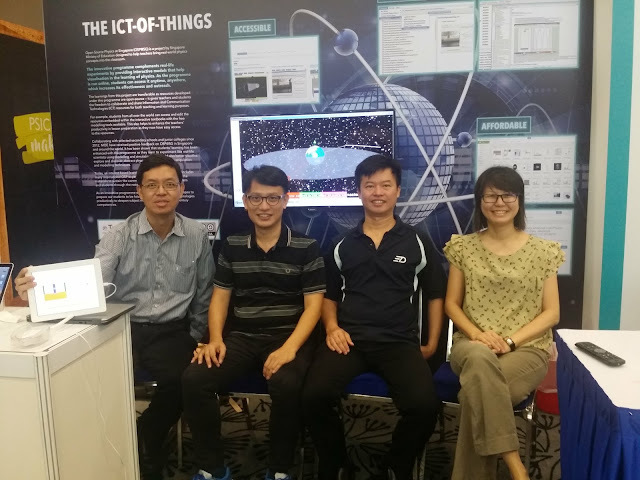 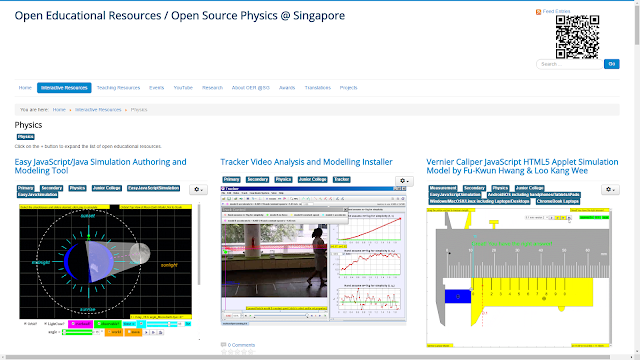 This MOE, Singapore project called, Open Source Physics at Singapore (OSP@SG) helps teachers to bring real-world physics concepts in and outside schools through Open Educational Resources. 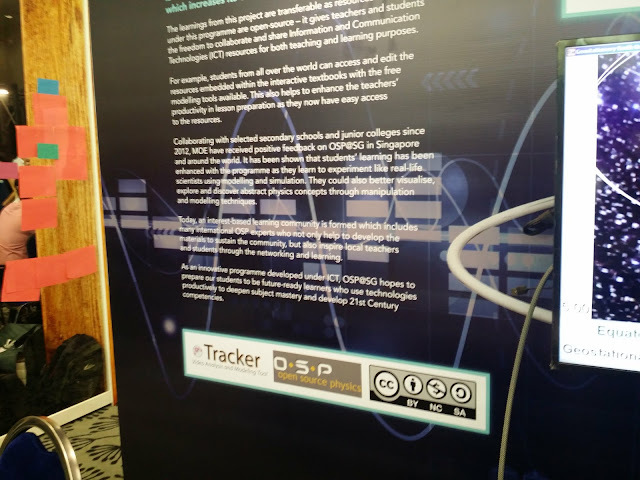 OSP@SG primary objective is to provide open source and open educational digital resources that runs on computers and mobile devices, complementing real-life experiments for an “inclusive and equitable quality education and lifelong learning for all”. OSP@SG also aims to inspire love for learning and promote learners to be more like scientists through the pedagogical practice of "mathematical modelling", where students’ mathematics ideas can be compared with real life and simulation data, themed as “pedagogical innovation” by UNESCO, Paris, 13th January 2016. 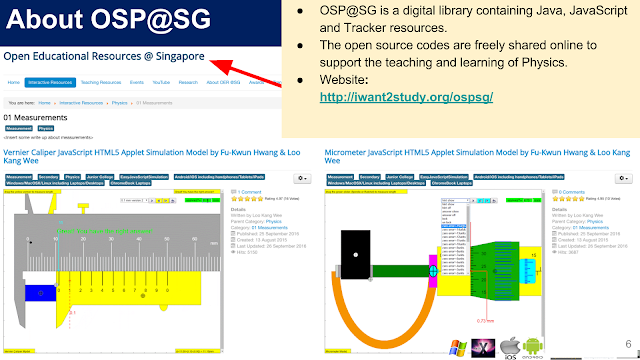 The transferability of OSP@SG is the "open data" idea, where the OSP@SG activists(teachers and students) published their usable digital resources with the source codes so that anyone could remix and redistribute the customized or re-purpose resources under the licenses compatible with creative commons attribution, share-a-like, not for commercial, CC-BY-SA-NC. 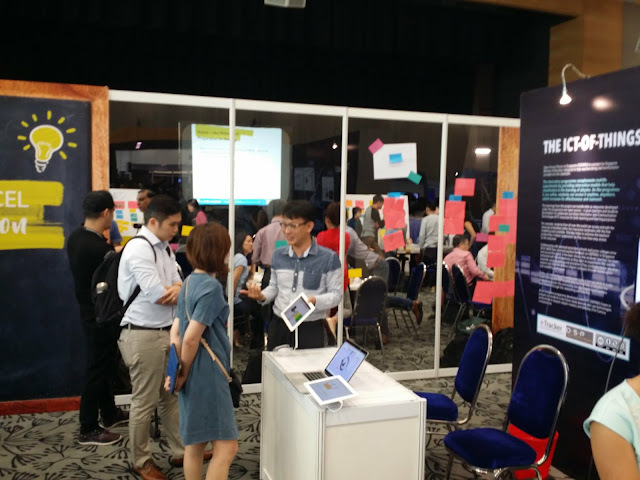 This idea can potentially change the world by lowering the barriers to high quality and customizable resources working towards the "The Incheon Declaration - Education 2030: Towards inclusive and equitable quality education and lifelong learning for all, a vision congruent and align to Singapore's Smart Nation initiative. Tangible benefits include MOE’s consistency in Student-Centric (student conducting virtual experiment using their own mobile devices), Values-Driven (contribution to less affluent societies) education and mastery learning with technology in schools. 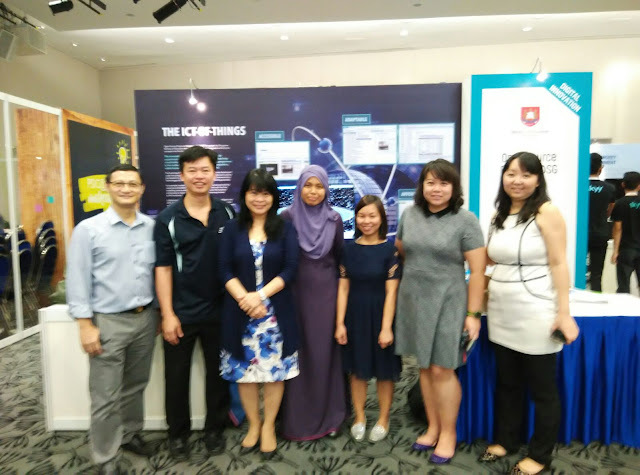 Non-tangible benefits include formation of networks of educators from Indonesia, Malaysia, Philippines, Thailand etc and knowing that OSP@SG have in some ways, benefited teachers and students beyond Singapore borders, shaping the world to be a better place for everyone. 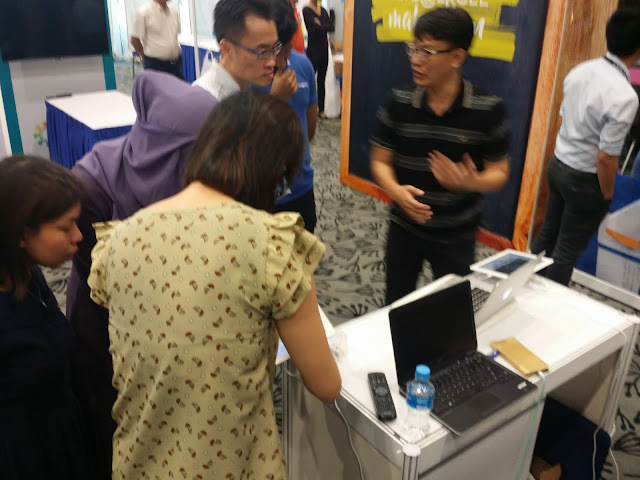 The key message is through Public Service, we can shape and give hope for a better future for everyone. 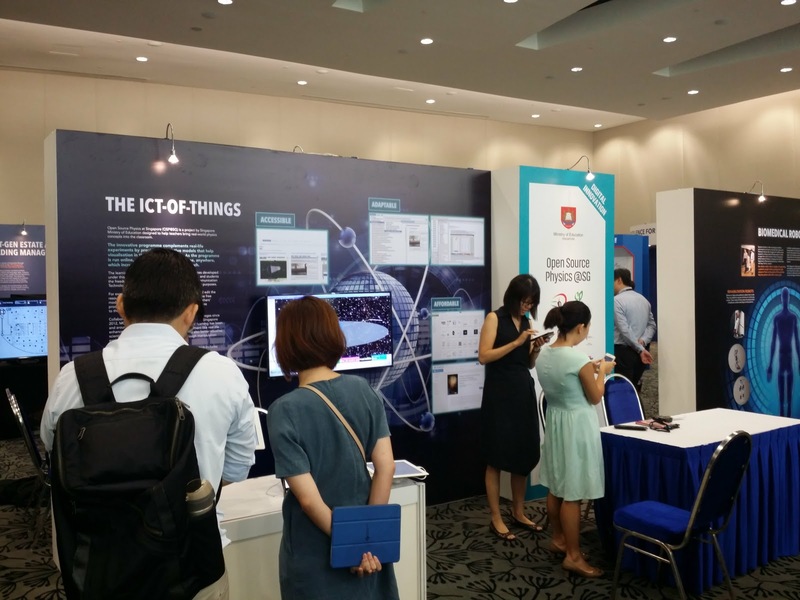 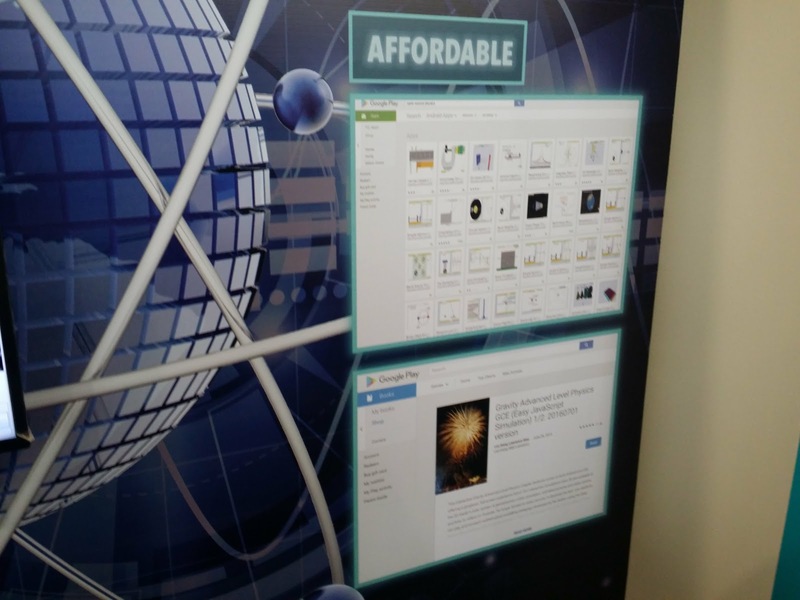 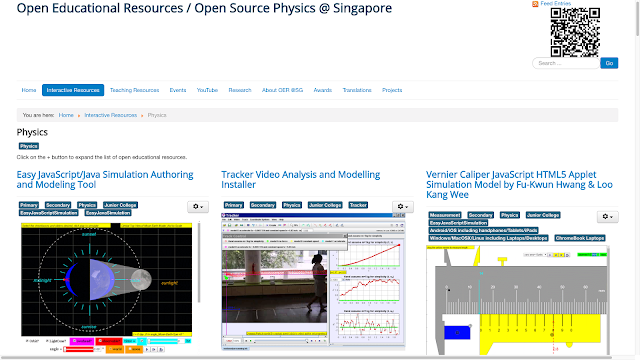 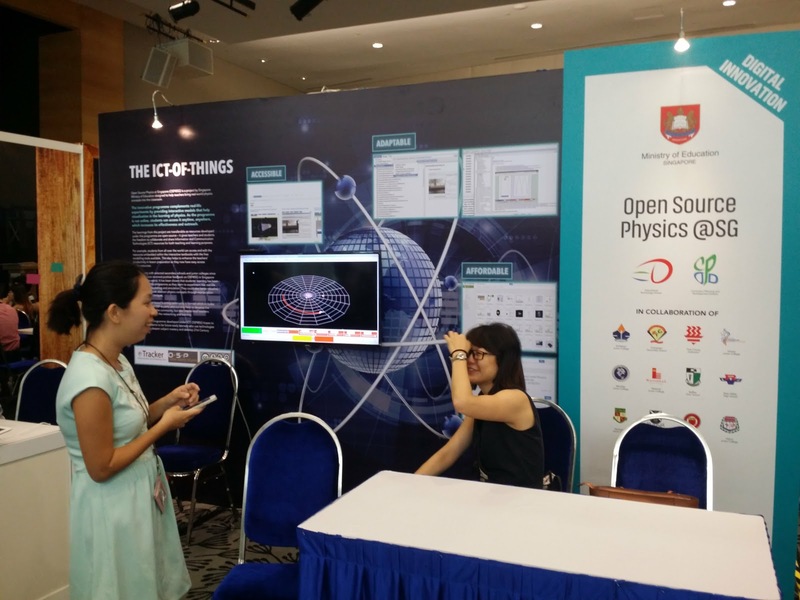 Visitors will be guided to the Open Source Physics at Singapore (OSP@SG) to access the website with 300+ open source and open educational digital resources that runs on their own mobile devices. 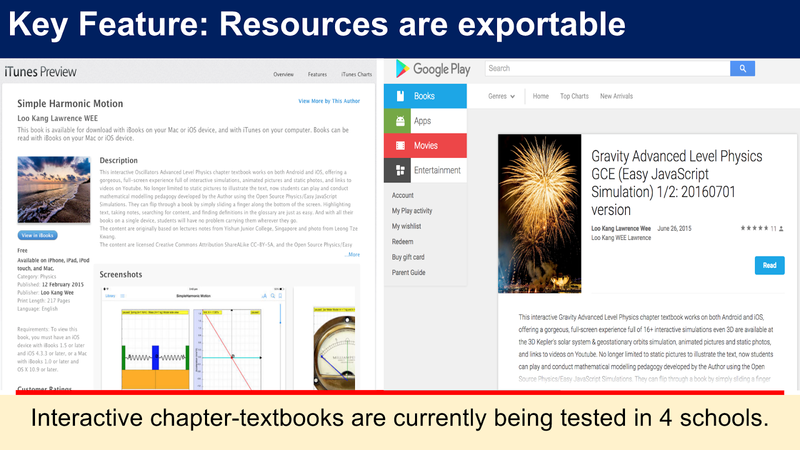 There are apps and e-books on Android Playstore and Apple App Store that can download these resources for off-line use. 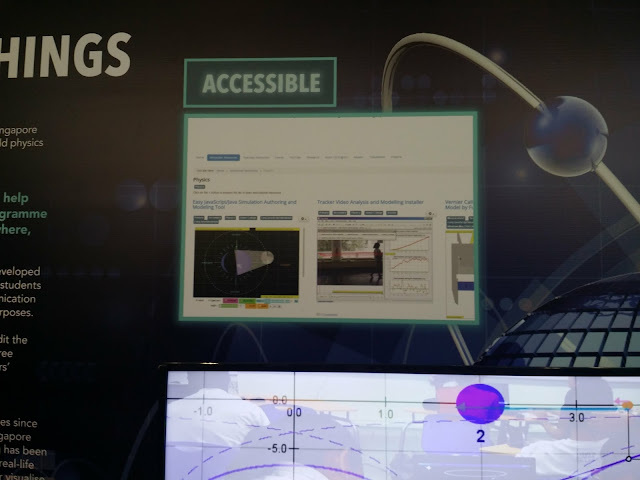 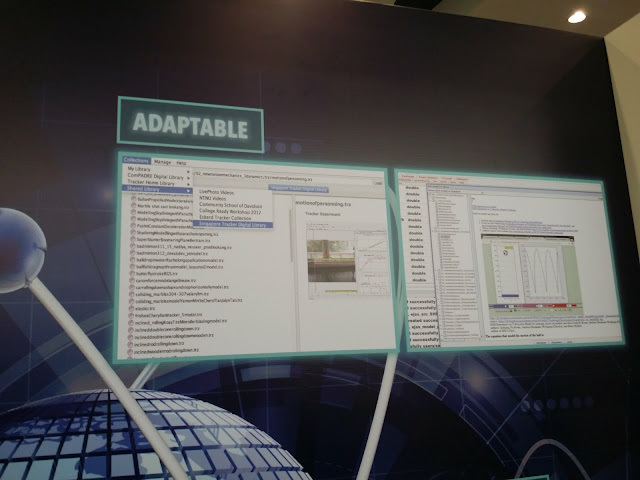 The interactive hands-on experience could take the form of visitors playing with the apps, ebooks, or interactive resources on their mobile device browser. For more interested visitors, there can be live demonstration of the actual tool. They will get to see where to get the source codes and understand simple ways to edit the source codes. This can be done on the spot to inspire them to start coding and redistributing their own re-purposed open educational digital resources. 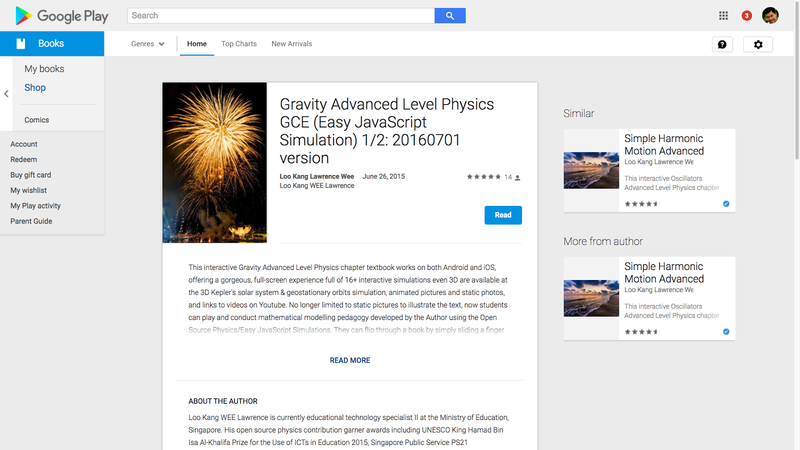 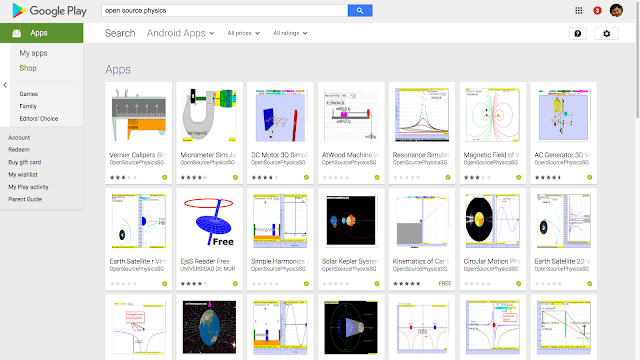 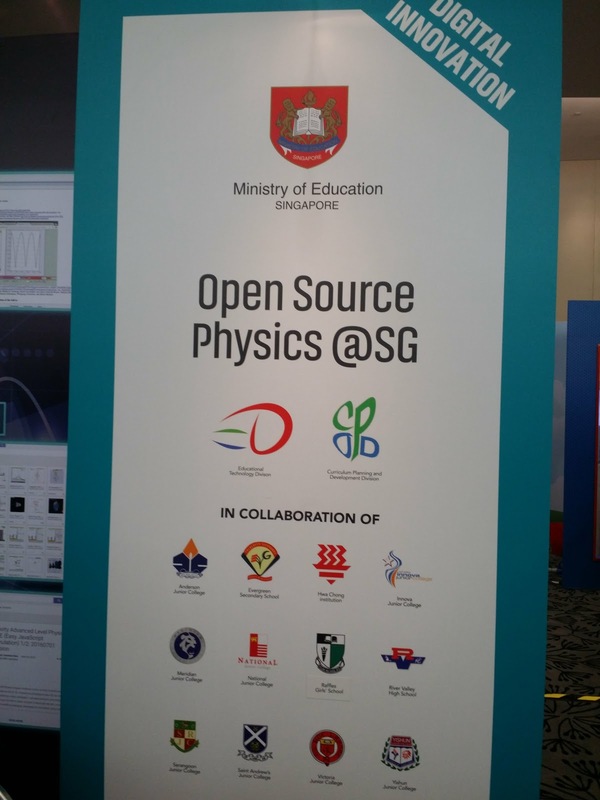 Visitors will be guided to the Open Source Physics at Singapore (OSP@SG) by Googling "OSP@SG" as keyword search, to access the website with 300+ open source and open educational digital resources (mostly Physics and Primary Mathematics) that runs on their own mobile devices. 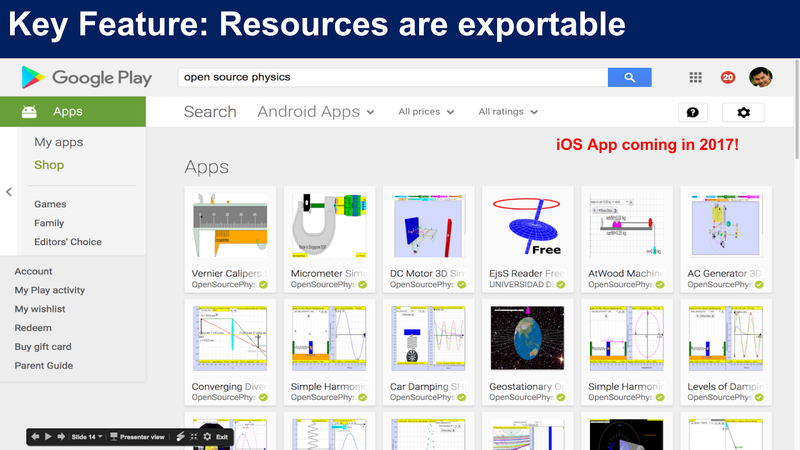 There are apps and e-books on Android Playstore and Apple App Store that can download these resources for off-line as well use, for an “inclusive and equitable quality education and lifelong learning for all". 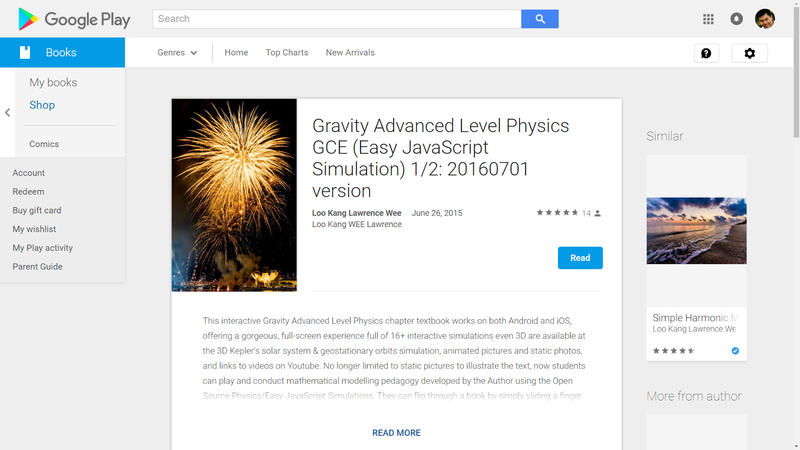 The interactive hands-on experience could take the form of visitors playing with the apps, ebooks, or interactive resources on their mobile device browser, Google Chrome is highly recommended. 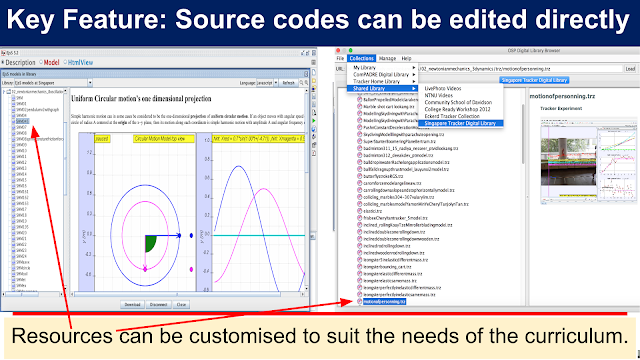 For more advanced visitors, live demonstration of the actual tools used can be shown, where to get the source codes and simple ways to edit the source codes can be done on the spot to inspire them to start coding and redistributing their own re-purposed open educational digital resources.